We offer Continuing Education to our members. And throughout the year we offer other training and education. Watch for future offerings. All agents must complete a Code of Ethics course at least every 2 years. The current cycle ends December 31, 2020. Agents can take the online course linked at the right or complete an online or in person class and submit certificate to the PLR office to update their education records. To check Continuing Education records or find a Kansas Real Estate school, visit the Kansas Real Estate Commission (KREC) website. 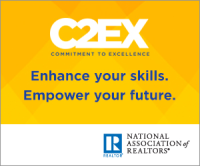 The National Association of REALTORS® proudly introduces Commitment to Excellence (C2EX), a program that empowers REALTORS® to demonstrate their professionalism and commitment to conducting business at the highest standards. REALTORS® defined professionalism in this industry more than 100 years ago when they created the Code of Ethics. C2EX takes professionalism to the next level by enabling NAR members to assess their expertise in 10 (11 for brokers) elements of professionalism ranging from customer service to use of technology. This innovative engagement tool encourages participation in all levels of the REALTOR® organization. It’s not a designation or a course. It’s not a requirement, but a benefit available to all NAR members at no additional cost.